ANN ARBOR, Mich., June 11, 2018 /PRNewswire/ -- Domino's Pizza (NYSE: DPZ), the largest pizza company in the world based on global retail sales, is saving pizza, one pothole at a time. Cracks, bumps, potholes and other road conditions can put good pizzas at risk after they leave the store. Now Domino's is hoping to help smooth the ride home for our freshly-made pizzas. 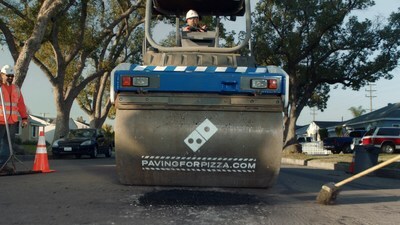 Starting today, Domino's is asking customers to nominate their town for pothole repairs at pavingforpizza.com. "Have you ever hit a pothole and instantly cringed? We know that feeling is heightened when you're bringing home a carryout order from your local Domino's store. We don't want to lose any great-tasting pizza to a pothole, ruining a wonderful meal," said Russell Weiner, president of Domino's USA. "Domino's cares too much about its customers and pizza to let that happen." 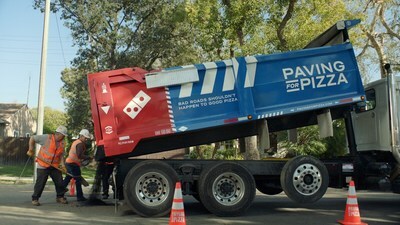 Domino's has already worked alongside four municipalities to help repair roads that directly affect their customers, including Bartonville, Texas; Milford, Delaware; Athens, Georgia and Burbank, California. Customers interested in nominating their town for a paving grant from Domino's can enter the zip code at pavingforpizza.com. If their town is selected, the customer will be notified and the city will receive funds to help repair roads so pizzas make it home safely. Customers can celebrate smooth roads with Domino's carryout special, featuring large three-topping pizzas for $7.99 each. Customers can order the carryout deal over the phone, in-store, at dominos.com, via Domino's mobile ordering apps or any one of Domino's AnyWare platforms, including text, tweet, Google Home or Apple Watch. To find the nearest Domino's location, visit dominos.com. More images and b-roll available at media.dominos.com. Founded in 1960, Domino's Pizza is the largest pizza company in the world based on global retail sales, with a significant business in both delivery and carryout pizza. It ranks among the world's top public restaurant brands with a global enterprise of nearly 15,000 stores in over 85 markets. Domino's had global retail sales of over $12.2 billion in 2017, with more than $5.9 billion in the U.S. and more than $6.3 billion internationally. In the first quarter of 2018, Domino's had global retail sales of over $3.1 billion, with over $1.5 billion in the U.S. and over $1.6 billion internationally. Its system is comprised of independent franchise owners who accounted for over 97% of Domino's stores as of the first quarter of 2018. Emphasis on technology innovation helped Domino's achieve more than half of all global retail sales in 2017 from digital channels, primarily online ordering and mobile applications. In the U.S., Domino's generates over 60% of sales via digital channels and has produced several innovative ordering platforms, including Google Home, Facebook Messenger, Apple Watch, Amazon Echo, Twitter and text message using a pizza emoji. In late 2017, as part of an industry-first collaboration with Ford Motor Company, Domino's began a meaningful test of delivery using self-driving vehicles.